Several months ago, our Windows computer died. This was the second time it had died within a year, and we were getting tired of such behavior. We'd been putting off purchasing a new Windows computer until the release of Windows Vista, the next generation of Windows. 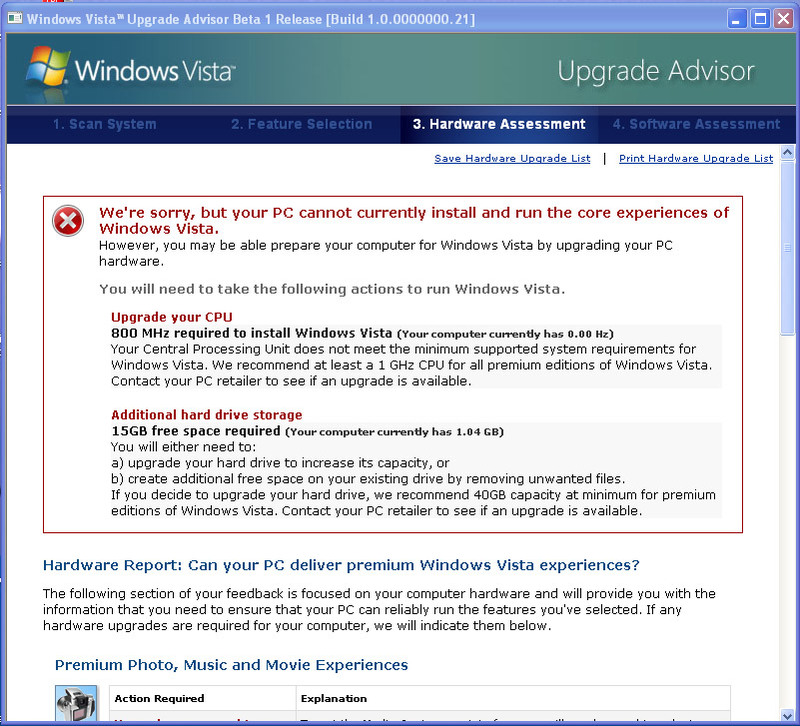 In spring 2006, Microsoft announced that Windows Vista would be delayed – again – until sometime in 2007. Since it was originally supposed to ship in May 2003, we gave up waiting and started to actively look for a new Windows machine. We found it in a strange place: at Apple. While we were looking for a spiffy Windows box, Apple announced Boot Camp, a "technology demonstration" as much as anything else. Called a beta test, it was a preview of what will be offered in Mac OS X 10.5 Leopard, which should come out in the latter half of 2006, or before Windows Vista, or most likely both. Boot Camp is very, very good (it is covered elsewhere in the Journal). But for us, a parallel effort holds more promise. A Virginia company, Parallels, Inc., released Parallels Desktop for Macintosh. Unlike Boot Camp, which forces you to restart to use Windows XP if you are using Mac OS X (or vice versa), Parallels Desktop allows you to run Windows XP, or several other versions of Windows -- or Linux or Solaris or other operating systems -- side by side with Mac OS X. Yes, if you want to get technical, they aren't really side by side: Windows (we'll assume you want to run Windows XP for the rest of this article) runs inside Parallels, and Parallels runs as a task under Mac OS X. You can quit out of Parallels just like you would any other Mac OS X application. Given these paths to Windowdom, we selected as our new, improved Windows computer an “Apple Mac mini Intel Core Duo” (what a horrible name) running Mac OS X 10.4. After trying out the Boot Camp beta and a demo of Parallels, we decided to go with Parallels Desktop for Mac, which in turn ran Windows XP. All this power and flexibility came on a computer not much bigger than a bestselling novel. Installing Parallels proved simplicity itself. You can purchase it via their Web site, download the installer, and have Parallels up and running in an hour; most of that hour will be spent waiting for an E-mail from Parallels with your installation code. Parallels is a standard Mac installer: double-click, answer a question or two, and you are done. Of course, you still must install Windows XP. For this you must purchase a full installation disc of Windows XP, which is not something you can download. Even with a physical disc in hand, it takes roughly eight hours (including meal breaks) to install Windows XP, install all the patches and such, and get it up and running. Unlike Mac OS X installations, you can’t just run the installer and then walk away; Windows asks all kinds of odd questions at random times, either during the installation or during the updates or patches or tweaks, and the process comes to a halt until you supply whatever is being requested. Fortunately, you have a fully functional Mac OS X machine right in front of you, so you can write E-mail messages or listen to iTunes or browse Web sites while Windows grinds along its user-friendly installation process. Not included in this time estimate is the week spent cajoling Microsoft into letting us install Windows XP. You must “register” Windows XP for it to run as something other than a 30-day demo, and by installing XP under Boot Camp first and then under Parallels, we’d triggered an anti-piracy alarm at Microsoft, disabling the ever so friendly 25-digit installation code. A week later, Microsoft graciously offered a heavily-accented substitute code of around 100 digits; type this code in perfectly and, eight hours later, you have Windows XP! Naturally, you can avoid this painful step by simply not trying out both Boot Camp and Parallels. Who needs choices, anyway? We took a series of screen shots of the Windows installation, using Parallels’ built-in Console Screenshot utility. They aren’t necessarily informative, but we found many of them quite funny. Parallels (and Boot Camp) requires a Mac with an Intel processor. Macs based on PowerPC chips can’t do this trick. Not even an übermachine, a Power Mac Quad-core G5, can pull this off. You need more than the standard amount of RAM. Unless you have some reason to be very stingy, we recommend a full 2 gigabytes of RAM (the maximum allowed in Intel-based Macs as of this writing) in the machine, though 1 gigabyte might do well for many casual users. Your maintenance tasks will, at best, double. Not only will you need to keep up to date with Mac software updates, but you'll also need to keep up to date with the even more frequent and more critical Windows updates. You'll need to invest in Windows anti-virus, anti-worm, and anti-spyware software, plus a good hardware firewall, if you don’t have one already. As of this writing, there are zero Mac OS X viruses, only a couple Trojan horses (all quite lame, which is a sad state for a horse, Trojan or otherwise), no worms, and no spyware. There are only a few ways to remotely exploit Mac OS X. But in the Windows world, life is far more dangerous, and you need to constantly update Windows and various utility programs that protect it in order to provide good veterinary care and keep it virus, worm and Trojan free. What does "constantly" mean? Windows virus updates are issued every day, and occasionally several times a day. You need a broadband connection. It is hard enough to run a modern operating system with only a dial-up connection to the Internet. It is impossilbe to run two modern operating systems over dial-up. The system updates, anti-virus updates, and other needs would be overwhelming. You need to know how to use Windows. Virtually everyone admits that Microsoft copied large segments of the Mac interface for Windows, but Windows is definitely not Mac OS X. There are similarities, and also vast differences. If you don't read manuals or directions, if you don't like following directions, if you don't like puzzling over why things don't work as expected -- you don't want to be running Windows, even part time, and can stop reading now. Parallels, Inc., does not offer Windows technical support; they support their product, but if you have problems with Windows, it is between you and Microsoft. Similarly, Apple doesn’t support Windows, either. Finally, Microsoft isn’t exactly eager to support Windows; they try to push technical support off on the manufacturer of the machine that came bundled with Windows and, in the case of a Mac running Windows, the manufacturer didn’t bundle Windows and doesn’t offer support. In short: you are on your own; think of it as an adventure. Windows XP running in a window under Mac OS X 10.4 on a Mac mini. Windows is busy with the two biggest uses for Windows: checking for viruses and playing Solitaire. Under Boot Camp, Windows XP is installed on a separate partition from Mac OS X. Mac OS X has read-only access to the Windows file structure, so Mac OS X can read files created or manipulated by Windows. And Windows XP can read from a second Mac OS X machine running SMB file sharing. 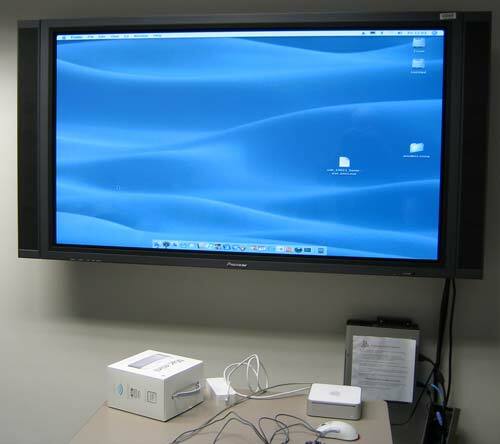 So yes, you can move things back and forth, but few users will figure out how to do so without help and, possibly, extra hardware, such as a pocket flash drive or a file server running on another machine. Parallels, on the other hand, comes with an option for sharing a directory. 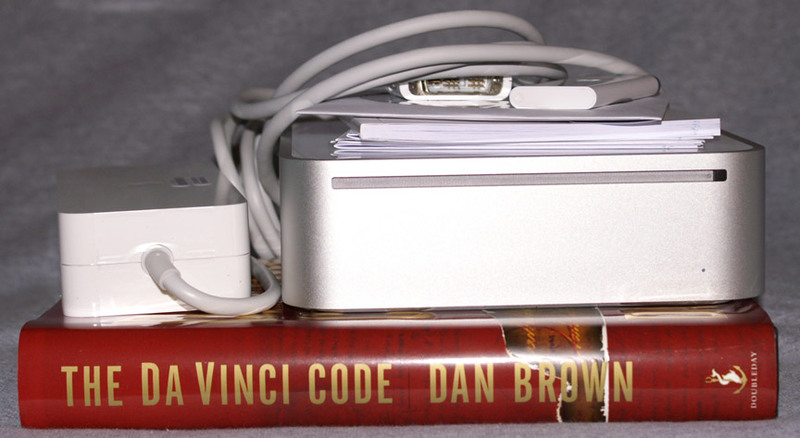 You designate, using a Parallels addition to Windows XP, one or more directories to be shared between Mac OS X and Windows, and both Windows and Mac OS X can read and write to these directories. This is unbelievably slick. You can also copy/paste between the two operating systems. Parallels does not require a separate partition. It places everything in a standard Macintosh directory. If you get annoyed with Windows XP (as if that were thinkable), you can simply grab the directory and trash it. Boot Camp and Windows XP is faster than Parallels and Windows XP. Under Boot Camp, your Mac is 100% Windows compatible, since you are literally running Windows on an Intel box. Games will undoubtedly be faster and smoother using Boot Camp. The weakness: when running Windows XP under Boot Camp, the Mac is a Windows box, with all of the weaknesses of Windows. There is no intervening layer of protection offered by the Mac OS X file and networking structure, or Mac OS X’s inherent paranoia, not to mention the built-in firewall. You must reboot the Mac to switch between Mac OS X and Windows. Getting a bit technical, because Boot Camp turns your Mac into a Windows box, it can do one particular hardware trick of great interest to gamers: it can write to the screen using Direct X. Parallels writes to the screen in OpenGL, which is an open standard well supported by Mac OS X. But because Parallels does not support Direct X, some games won’t run at all under Parallels, or will run considerably slower than under Boot Camp. Parallels, Inc., is rumored to be “thinking” about supporting Direct X, but aside from games and some very specialized software, the lack of Direct X support is more a footnote than a limitation. 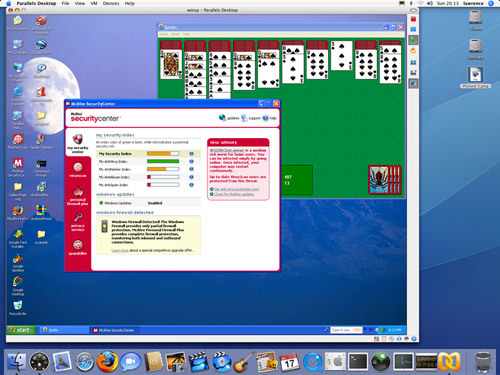 Parallels offers the opportunity to run Windows XP in a Mac OS X window; you can switch back and forth between Windows, iTunes, Safari, and anything else you might care to play with. You can also switch to a full-screen mode, though Mac OS X is still running (and some things, such as Activity Monitor, will still float over the top of Windows XP). Under Boot Camp, Windows XP not only fills the screen but the entire universe; Mac OS X does not exist. Parallels does not currently support Windows Vista. 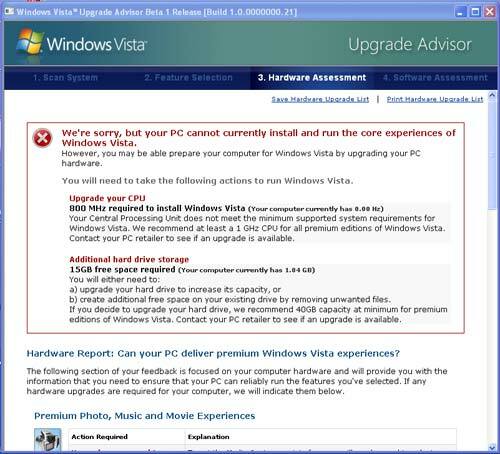 When running Microsoft’s Windows Vista Upgrade Advisor, the “advisor” complains that you have a computer running at 0.0 Hz, and apparently this is too slow… Parallels, Inc., is rumored to be working on support. Memo to self: zero Hz is apparently too slow for Windows Vista. Or at least for the "core experience." Since Apples have cores, and since a Mac mini Intel Core Duo has two, this is a shame. Parallels supports all the USB devices I tried with it (a Mac keyboard, a Microsoft optical mouse, a Lexar flash drive), but there are complaints that it doesn’t work with various things that people might plug in. In reading the complaints, it is clear that many people never bothered to read the documentation: Parallels workstation has a menu option to “Install Parallels Tools” into Windows XP, and these tools greatly improve screen responsiveness, USB support, and life in general. Just the same, USB support is considered not particularly robust in version 1.0. While Parallels running Windows XP is slower than running Windows XP directly via Boot Camp, it is fast enough to be fully functional, and considerably faster than our now dead Dell Pentium 4 computer. Under Parallels, you can easily share files between Mac OS X and Windows XP, you can see both running at the same time, and you can treat Windows XP as a process and kill it, restart it, or ignore it at will, without disrupting the Mac. You don't need to reboot the machine to switch operating systems. And Windows XP is wrapped in the Mac OS X file and networking structure, and fortified behind the Mac firewall. When you quit Parallels, you are offered the option to “suspend” Windows. If you select this option, the next time you start Windows you will be right where you left off: running applications will still be running. After experiencing this a time or two, you find you never want to go back to the standard Windows boot process again. One thing we hadn’t considered: Front Row and the Apple Remote. Get tired of playing with Windows? Get up, go fling yourself down in a comfortable chair, and use Apple Remote to pick out some nice music or watch a movie. You can leave Windows running; Windows neither knows nor cares that Mac OS X is busy entertaining you. This simple control panel allows you to start, stop, and pause Windows XP using Parallels. You can also configure how much memory Windows XP uses, how much hard drive space it can use, how it should talk to the network, and other basic details – or you can ignore all the settings and accept the defaults. 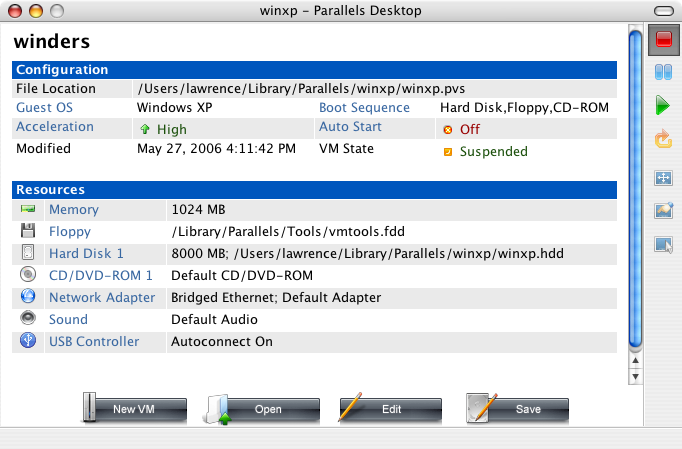 "Winders" is our name for the virtual directory, and not some nasty comment by Parallels, Inc. It is our nasty comment. As far as we can tell, Parallels uses only one of the two processors in our dual core Mac mini. This isn’t necessarily bad: the other processor is running Mac OS X, so everything moves along quite briskly. Just the same, it is the only Mac OS X program we’ve used that doesn’t automatically and transparently use both processors on a dual processor machine. Somewhat more annoying: CLT-Alt-Delete. If you want to lock the screen in Windows without actually shutting everything down, you simultaneously press the Control key, the Alt key, and the Delete key. This doesn’t work when running Windows XP under Parallels. In several weeks of investigation, it was clear that it didn’t work under Boot Camp and Windows XP as well, at least when people were using a Macbook or Macbook Plus. The Macbooks don’t have a Delete key. But the standard Apple keyboard does have a Delete key, and the Option key is even conveniently marked with “alt” written above it in one corner. Therefore, CTL-Alt-Delete should work – but it didn’t work for us. This may seem a trivial issue, but most Windows-centric organizations will not allow you to bring in a Windows machine that you can’t lock up by pressing CTL-Alt-Delete. The Center for Internet Security (http://www.cisecurity.org/), for example, considers this “three fingered salute” to be a standard part of a baseline installation of Windows. Q. What happened to Lock Computer? In Windows 2000 and Windows NT version 4.0, you could type CTRL+ALT+DEL to bring up a window that contained the Lock Computer option. In Windows XP, this key combination brings up the Task Manager. 1. Open User Accounts in Control Panel. 2. Click Change the way users log on or off. 3. Clear the Use the Welcome screen check box. In other words, Windows XP isn’t supposed to use CTL-Alt-Delete. But since Windows system administrators expect this behavior, we made the necessary changes and now Windows works as they expect. One very pleasant discovery: Parallels is extremely stable. We gave it some mind-numbingly difficult tasks that sucked up vast amounts of RAM and disk space, and kept it busy for hours on end. The tasks were completed in completely unremarkable fashion – except that we got the results much faster than on the late, unlamented dead Dell. Among other things, the Dell tended to crash; the Mac mini running Parallels and Windows XP did not. On a Mac mini, both Boot Camp and Parallels perform well. On an Intel-based iMac or MacBook Pro, both should be screamers, since these machines have very powerful dedicated video cards (and are also simply faster). Having said all this: don't try either Boot Camp or Parallels unless you know enough about Windows XP to lock it up and protect it. Until there is a cure (Microsoft hopes Windows Vista will be the cure), you can't fully protect Windows XP by faking it; genuine skill and knowledge is required, too. Meanwhile, you can run Windows on the slickest Windows machine yet produced: a Mac. Check out the installation pictures, too.